Today’s trip was absolutely breathtaking, with a couple of whales who would not leave us alone. We got to see all of the Marine Big 5 apart from the dolphins with only a light breeze blowing, and it really was a trip to remember. Our tour started with a cruise along the sandy white beaches of Uilenkraalsmond, where we took in the sights and scenery before moving towards Slashfin to see if we could spot some Copper Sharks. We got lucky, spotting these gorgeous creatures just as we stopped. We had a couple of sharks around, so we hung out for a while and watching as these creatures moved effortlessly below the water before going closer to Slashfin to check out what they were up to. Once we’d had a fair share of shark time, we decided we would go to Pearly Beach to see what the whales were doing. As we came around Sandy Point, Kira and his eagle eyes spotted a spout and as we got loser we realized that we were in for a treat. 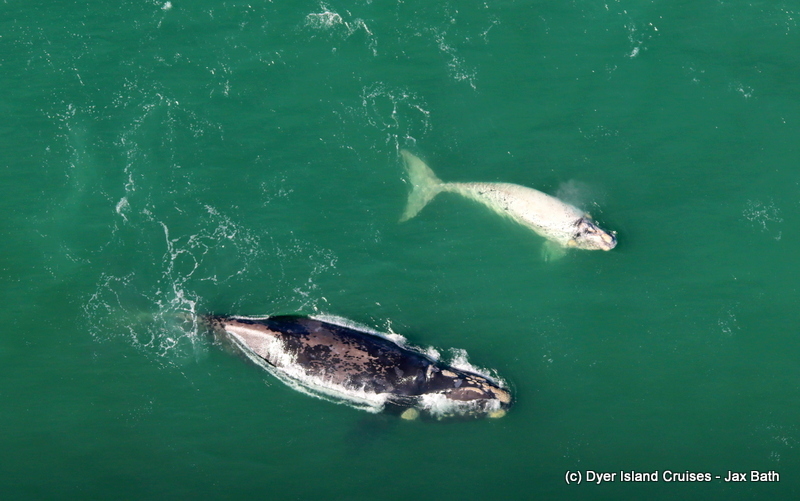 Our first pair of Southern Right Whales was a half brindle mother and a brindle calf! Only 4% of our population are born completely white and we were thrilled to have caught up with such a unique and beautiful pair. What happened next took our breath away. For the next 20 minutes, the whales would approach the boat, and then move away only to come up right next to us once again. It seemed as though they could not get enough of us and the little baby was an absolute superstar, doing some spy hopping, rolling on his side a time or two and even sticking his head and tail out at the same time. The visibility was also beautiful, so when they were close, we got some excellent views under the water. Mom was super relaxed an absolutely massive and this was without a doubt the highlight of the tour. We also got to see a couple more pairs of Southern Right Whales here, as well as a juvenile African Penguin. This penguin stayed at the surface for along time, so we got to take some great photos before moving towards Geyser Rock. Here, we took in the sights and smell of our super seal colony, with hundreds of animals in the water trying to escape the heat, we made our way along the edge of their 3 hectare island, watching as they went about their daily business in the clumsy way only a seal can. After spotting some big bulls and some tiny pups, we excited the alley and slowly made our way to port. The Cow, calf pair from our trip photographed from the air a few days prior. One can see just how distinctive the markings are.